The X3 was completely redesigned to feature all new powerful engines, great technology, and driver assistance features. You can now get blind spot monitoring, lane departure assist, and parking assist within the standard model of the X3. There is also a new rear-wheel drive trim called the SDrive 30i trim for additional power. 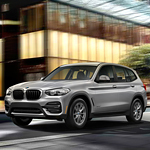 Want to experience the all new BMW X3? Get more in one with the latest BMW model. You can test drive it today at BMW of Denver Downtown.